During your stay, your group can enjoy quality meals comfortably served in T.G. Walters Dining Hall. The Center's dining hall features custom made, solid maple tables with padded crown-back chairs! 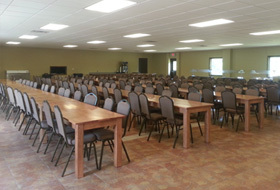 Our staff would also love to serve your group for a special occasion, such as a sports banquet or fundraising banquet.